If you have ever simmered meat bones for a soup then chilled it, you may have noticed a slight jellied effect to the broth. This result is due to "collagen", a protein substance which yields gelatin and is found in the bones, skin and connective tissue of animals. In manufacturing, unflavored gelatin is extracted from the collagen by hot water, then concentrated and filtered for purity and clarity. It is cooled, extruded and dried into glassy brittle strips. 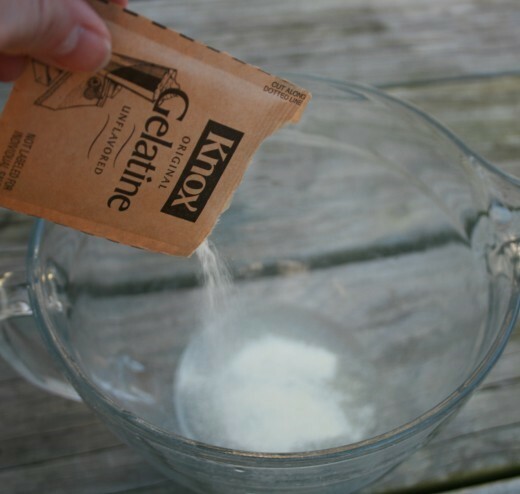 In 1889, Charles B. Knox of Johnston, New York discovered a method of granulating gelatin by breaking down the strips using high speed mills. Most unflavored gelatin is packaged in pre-measured individual envelopes for convenient usage. Each envelope of Knox® Unflavored Gelatin will gel 2 cups of liquid. If the recipe you want to use calls for unflavored gelatin by the tablespoon, just use 1 envelope for each tablespoon called for. Clear or simple gel: This is the place to start. A clear or simple gel is a basic juice or broth mixture. Solids may be added after the mixture has chilled to the consistency of unbeaten egg whites. A Tomato Aspic is commonly made from a clear gel. Whip: A whip is a clear gel that has been chilled until partially set and then beaten until fluffy. Solids are not added to whips. Snow: A snow is a clear gel that has been chilled until partially set; unbeaten egg whites are added and the mixture is beaten stiff. Solids are also not added to snows. This dish is sometimes called a "sponge." Mousse: A dessert favorite, the mousse is a clear gel that has been chilled until the mixture mounds slightly when dropped from a spoon. Whipped cream is then folded in, along with any solids you would want to add. Custard Gel: A custard gel contains egg yolks, milk, and gelatin cooked to form a custard base. Chiffon: As with mousse, chiffon is a custard gel that's been chilled until the mixture mounds lightly when dropped from a spoon. Then stiffly beaten egg whites are folded in; solids may also be folded in at this time. Bavarian: Another popular dessert, a Bavarian is a chiffon with the addition of whipped cream. Soufflé : This can be a sweet or savory dish (one of our favorites being the Spinach variety). But as a dessert, it can be a mousse, chiffon, or Bavarian mixture chilled in a soufflé dish with a collar. Charlotte: A charlotte is a mousse, chiffon, or Bavarian mixture chilled in a bowl, loaf pan, or spring-form pan lined with ladyfingers. Blend 'n Gel: This is a clear or custard gel prepared in a blender or food processor. Generally, ice or another frozen food is added to speed the gelling process. this stand for 1 minute. 1-2 minutes, depending on the amount and the temperature of the liquid. 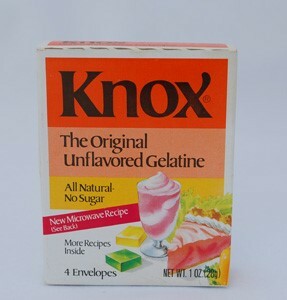 I've been cooking with KNOX Gelatin for years and love this product. 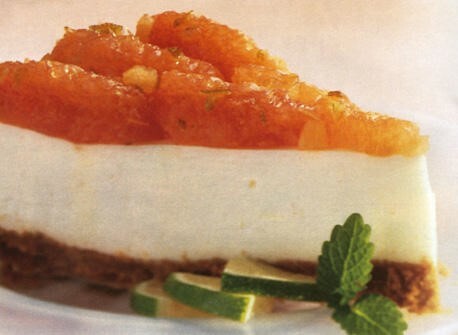 A favorite KNOX Gelatin recipe at our house is a cheesecake that incorporates pink grapefruit slices. It's an unusual dessert that has people begging for seconds. Colorful, creamy, and "DELICIOUS" only begins to describe this luscious refrigerator cheesecake. light, refreshing end to any meal. spring-form pan or 8-inch pie plate. Bake in preheated oven for 10 minutes. Set aside. in sour cream and half of the warm gelatin mixture. Spoon onto prepared crust in pan. Smooth top. 3 hours or until set. Remove sides of pan and slice into wedges.